Star Wars creator George Lucas says he hasn't yet spoken with new Star Wars director J.J. Abrams, but he's sure he'll call soon. George Lucas won a Daytime Emmy Award on Sunday for Star Wars: The Clone Wars, the animated series on which he serves as executive producer, and while it may seem odd that the Man Who Made Star Wars won an award usually handed out to soap opera actors and daytime talk show hosts, he seemed suitably proud of the accomplishment. But it was his comments about the future of the Star Wars franchise at the tail end of his brief interview with Access Hollywood that were of particular interest. 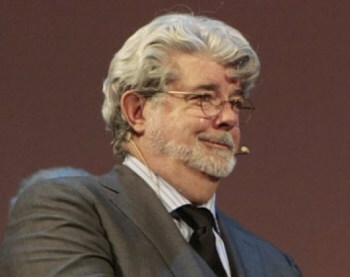 When asked how he felt about passing the torch, Lucas said, "It's great, I don't have to worry about these guys anymore," but also revealed that despite being retained by Disney as creative consultant, he has yet to hear from J.J. Abrams, the current King of Hollywood, who is signed to direct Star Wars VII. "I have not spoken to J.J., he's been busy with Star Trek and I'm sure that he'll let me know when he's got some questions," Lucas said. "So, you know, that's all going well. Kathy [Lucasfilm President Kathleen Kennedy] tells me it's working out great." Lucas may be the fount from which all things Star Wars sprang but he's also been pilloried over the last, oh, decade or so for turning the franchise into a CGI-fueled family-friendly embarrassment. Abrams will no doubt sooner or later pay his due respects to the man that laid the foundations upon which his career is built, but as for plotting the future of the galaxy far, far away, it sounds like George's time is well and truly over.